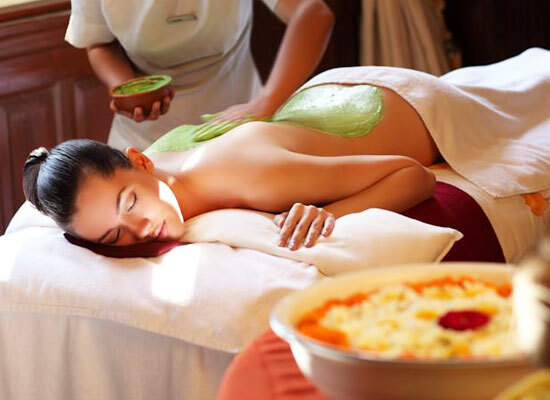 "Ideally located in the tranquil surroundings of the Himalayan foothills, the Ananda in Himalayas is a destination par excellence for a complete and comprehensive relaxation of the body, mind and spirit. The settings, near the mythological cities of Haridwar and Rishikesh, enveloped in the embrace of beautiful Sal forests and overlooking the majestic Ganga are just icing on the cake as the retreat leaves you breathless with its well-known, traditional Indian wellness regimes. Combining the best of knowledge from Ayurveda and Vedanta and International Wellness experience, Ananda in Himalayas is place that will rejuvenate you to the core, making you to come back here again and again. Ananda in Himlayas, a Destination Spa hotel was originally a palace. The palace was the residence of erstwhile Maharaja of Tehri Garhwal. After a complete renovation, the palace was transformed into a spa. The name of the palace was Viceragal Palace before its transformation into a hotel. Later, it got the name of Ananda in Himalayas. The accommodation at Ananda in Himalayas is one of the special highlights of the resort which is aimed to give a wonderful, luxurious and comfortable living experience to the guests. Mentioned below are various accommodation options at the resort to suit your needs and preferences. Palace/Garden View Rooms These luxurious rooms are 45 sq. m in size and feature luxurious fittings and overlook panoramic views of the valley or the Palace. Each of these rooms are equipped with DVD player, LCD television, well stocked mini bar, tea/coffee maker, complimentary WI-FI and electronic safe. Valley View Rooms The room features walk in-closets and perfectly equipped bathrooms which overlook the picturesque views of the valley. These 45 sq. m deluxe and luxurious rooms open into large balconies that offer great place to have a perfect meal. 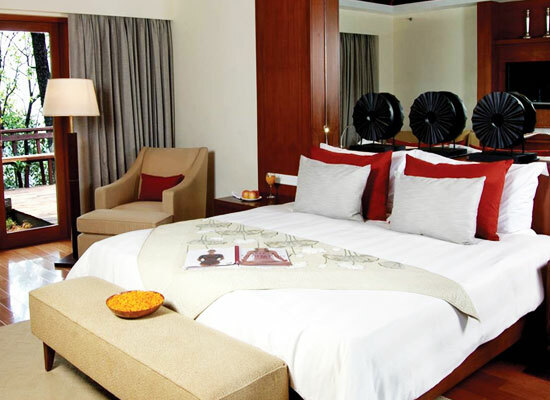 Valley View Rooms too are equipped with all the facilities as Palace/Garden View rooms. Premium Valley View Rooms These rooms are located on the higher floors and offer brilliant views of exquisite mountain ranges which are visible from any area of the property. These impeccable rooms either face the Maharaja’s palace or the valley. The room features tastefully done bedrooms, large and fully equipped bathrooms and amazing garden views. Moreover, quiet private gardens, affording wonderful views of the valley append to the charm and isolation of these suites. This 3-bay splendid suite is located on the ground floor and oozes out luxury and charm. With spacious and well-fitted bathroom overlooking amazing views and remarkable private sitting and dining areas, the suite is a perfect complement to your stay at the resort. The suite is also adorned with an excellent private garden, offering you excellent privacy and tranquil atmosphere. The suite also has an extra powder room, in addition to shower room in the main bathroom. Situated within the precincts of the Maharaja’s Palace, the Viceregal Suit is a splendid retreat for those used to luxury and comfort. The room is made up of a spacious sitting area a four-poster bed. 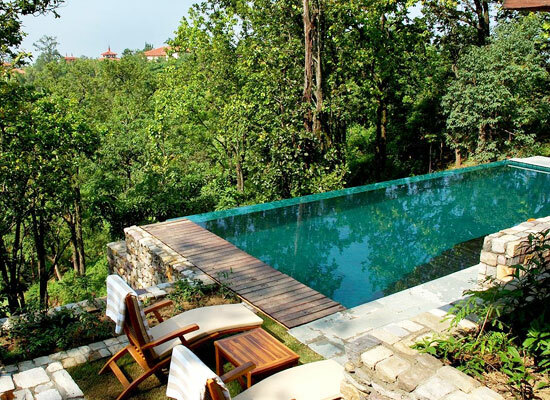 Luxuriously provided with an attached dressing room and a fully-equipped bathroom, the room afford great views that overlook the picturesque gardens and the distant Ganga valley. The stay at Viceregal Suit is an amazing experience and brings you back to the threshold of India’s wonderful past. Ananda Villas are named after the great heritage mountain ranges Himalayas and the Shivalik and after the majestic river Ganges. 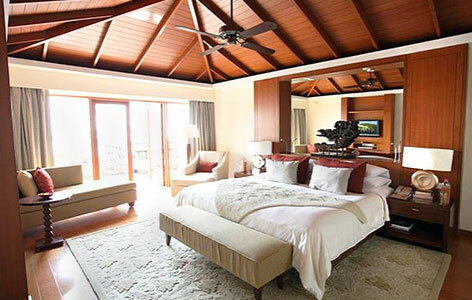 There are in total of 3 villas with two 2-bedroom and one 1-bedroom suites. However all the rooms are gracefully equipped with a living room, a pantry for the butler and a large bathroom that feature a private sauna and an unrestricted view of the private swimming pool. This exquisite 40 sq. m private pools that surround this area are embellished with relaxing lounge beds. 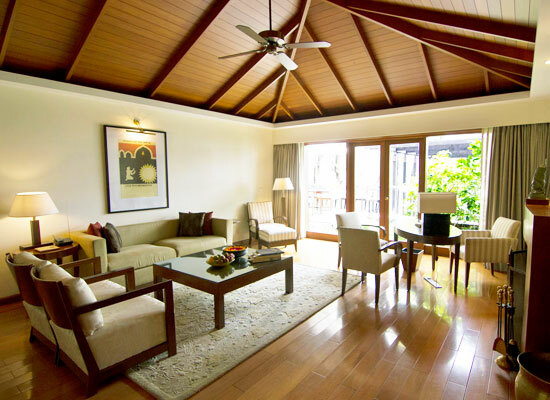 The Ananda Villas are amazing and are perfect to enjoy the quiet and tranquil environment. Ananda in Himalaya afford its guests a world class dining experience. The following are great options at the resort to enjoy your food and drinks in the wonderful settings, delicately planned to mesmerize you with the service at Ananda. 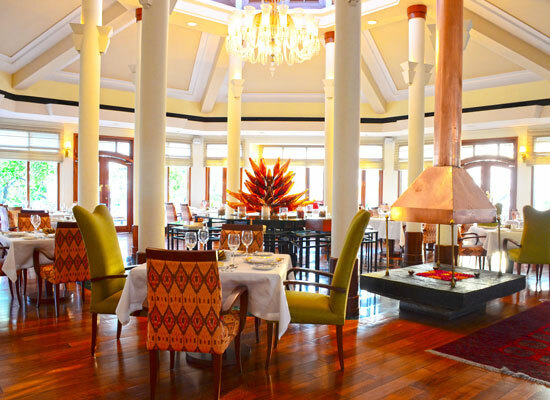 This is the signature dining area of the resort and a great place to enjoy a variety of Indian, Asian and Western cuisines.All the dishes are prepared carefully by expert chefs, keeping in mind the taste as well as health of the visitors. Since the guests are on a wellness program, most of the dishes are prepared on the Ayurvedic Principles that suggest a perfect balance of the five elements of nature. Along with exploring new vistas in modern gastronomy and due to long stays of guests at the resort, the menus is changed every four months, according to the season. The Tea Lounge at Ananda is fantastic place to enjoy tranquility and long conversations with a refreshing cup of tea and snacks. The lounge is located in the Viceregal palace and has comfortable, warm and romantic settings. Adorned with portraits of such historical figures as Lord Mountbatten, the erstwhile Maharaja and other political figures who visited Narendra Nagar during his reign, the lounge also furnish a unique taste of history. Quiet and placid ambience with comfortable lounge sofas and tapestry is a distinguished experience at the Tea Lounge which is worth cherishing. Adorning the side of the hill that slopes down to the valley and surrounded by the natural forest on one side and an exclusive Spa building on the other, this place is the ultimate location to enjoy your food and drinks. Enjoy the ethereal views of nature sipping fresh juice or relax for a healthy sun-tan relishing garden fresh vegetables and organic greens. The situation of this amazing point is wonderfully chosen to give you a perfect feeling of comfort and pleasure while reveling your meals. There are special private venues to offer you a magical dining experience and if you need privacy for any special occasion, this is the best place to be. The chefs at Ananda will always be at your service to create a customized menu that suits the mood and occasion. Enjoy great food and moments at this enchanting private dining experience at Ananda. Rishikesh and Haridwar are regarded as the entry point of four principal pilgrim destinations; Kedarnath, Badrinath, Yamunotri and Gangotri. The serene town of Rishikesh is bordered on three sides by hills. River Ganga flows through this picturesque town.